The development of new therapies is a highly regulated, costly, long and complex process. In an era of growing demand, pressure on healthcare budgets, and emphasis on patient-centricity, quality and sustainability of healthcare, it is critical to take patients’ needs into account at all stages of research – from research priorities over research design, planning, conduct and operations of research to the dissemination of research results and post-approval mechanisms. Patient involvement has the potential to reduce the waste of unnecessary research while increasing the value and outcomes. To do this, patient involvement is increasingly recognized as a key component in the redesign of health care processes and is advocated as a means to improve patient safety and to increase efficiency in developing new therapies. The value of patient involvement in medicines research and development (R&D) is increasingly recognised by all health stakeholders. Despite numerous ongoing patient engagement initiatives like the European Patients’ Academy (EUPATI) and Patient-Focused Medicine Development (PFMD), patient involvement so far lacks structure and consistency in approach. Limited formal documentation of patient involvement activities further hampers the sharing of experience and learnings, preventing timely and systematic implementation. In an article of Bettina Ryll, Mary Uhlenhopp and Susanna Leto that will soon be published in the journal “Therapeutic Innovation & Regulatory Science”, we are describing the outcomes of several multi-stakeholder discussions during 2015/2016 in a practical roadmap for patient involvement in medicines R&D. 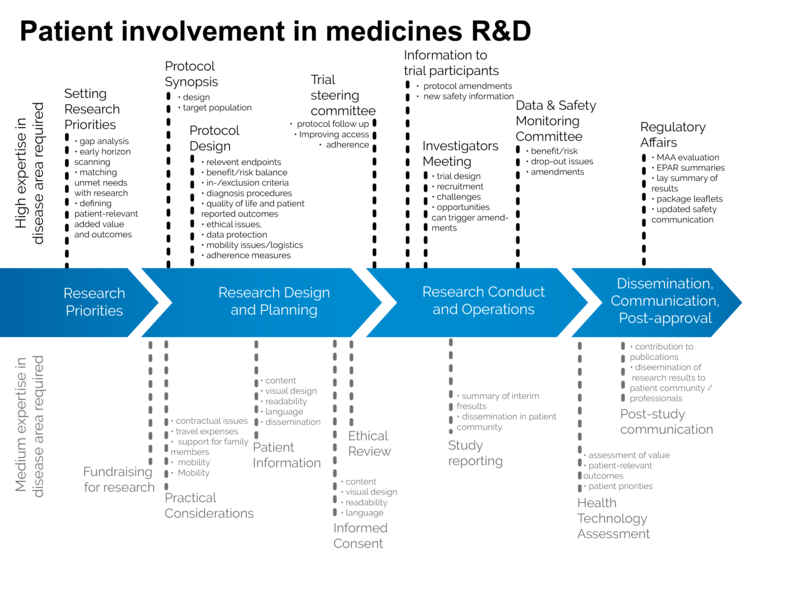 The roadmap highlights specific opportunities for patient involvement along the four key stages of the medicines R&D lifecycle and is illustrated with concrete examples. This roadmap’s aim is to provide a tool to facilitate patient involvement during medicines research and development and is being shared to encourage implementation and further refinement. The roadmap intends to stimulate further discussion. All involved parties, academia and pharmaceutical industry, patient organisations and patients, clinicians and researchers, will need to be involved in the identification of strategic patient involvement points and their implementation to maximise the benefit for all stakeholders. In addition, the EUPATI Guidance Documents cover the interaction with regulatory agencies, HTA bodies, ethics committees and the pharmaceutical industry when aiming to interact involve patients in medicines research and development. There are four separate guidance documents covering patient involvement inPharmaceutical industry-led medicines R&D,Ethics committees,Regulatory processes andHealth technology assessments (HTA). Not only provide they proactical guidance on how to interact effectively and transparently, but they also help to define more clearly what kind of input from patients is required – individual input with anecdotal patient experience, input from patient advocates who oversee the needs of a larger group of patients, formal positions of patient organisations, or input from patient experts who, in addition to aforementioned insights, also have the technical skills and training. The question of system-readiness remains, as the Roadmap and the Guidanc Documents need to be put into practice by research groups and industry. This is what patient advocates like us and EUPATI Fellows do in practice, building on years of valuable experience in providing such input.